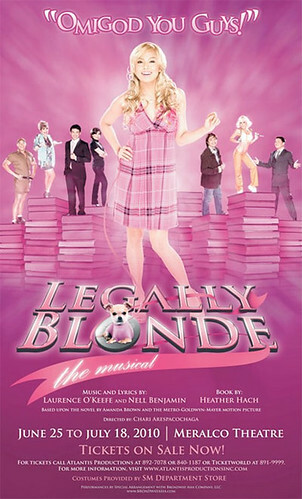 Legally Blonde: the Musical is here in the Philippines! Are you a fan of Elle Woods? You know, that blonde sorority girl who managed to attend law in Harvard University and actually made a difference in the real world despite her girlish ways! She's the main lead character in Legally Blonde 1 (2001) and 2 (2003), portrayed by Reese Witherspoon! Well, the movie became a musical last 2007 and debuted last January 23, 2007 at San Francisco. It opened on Broadway 3 months after. Now, Legally Blonde: The Musical is staging here in the Philippines! Hurrah! The show is brought to us by Atlantis Productions and has selected TV and recording artist Nikki Gil to play the lead role of Elle Woods. The Musical opened here in Manila last June 25, 2010 at the Meralco Theater, Ortigas Avenue, Pasig City. The Musical takes on the story of the 1st Legally Blonde movie. Sorority star Elle Woods doesn't take "NO" for an answer. So when her boyfriend dumps her for someone "serious", Elle puts down the credit card, hits the books, and sets out to go where no Delta Nu has gone before: Harvard Law. Along the way, Elle proves that being true to yourself never goes out of style. We have music and lyrics by Laurence O'Keefe and Neil Benjamin, a book by Heather Hach, and directed by Chari Arespacochaga. Legally Blonde: The Musical in Manila also has a strong cast. Guji Lorenzana plays Warner Huntington III, Nyoy Volante as Emmet Forrest, Geneva Cruz as Brooke Wyndham, Jett Pangan as Professor Callahan, Cris Villonco as Vivienne Kensington, Jinky Llamanzares as Paulette Bonafante, and Calvin Millado as Kyle. In any production, there are costumes! SM Department Store partners with Atlantis Productions to officially dress the cast of Legally Blonde The Musical here in the country. Now we all know that Elle Woods and the other casts of Legally Blonde is also about fashion, so expect sassy styles from the show too. As a bonus, SM Department Store says that most of the clothes you'll see during the musical will be available in their branches! I rarely see stage plays or musical shows. But when my sister asked me if I wanted to join her to watch Legally Blonde The Musical, I didn't hesitate to say yes. I love the Legally Blonde movie and my hopes are up for this musical. Oh, and by the way, I'll be dragging (yes) my partner into this. Hopefully, we'll both enjoy the show! The musical will last until July 18, 2010. Hurry and get your tickets by calling Atlantis at 8927078 or Ticketworld at 8919999. Ticket prices range from Php500 - Php1200. For seating arrangements and availability of tickets, please visit Ticketworld here.